"Old is Gold". This phrase is apt for the Indian gold and silver embroidery- Zardosi work. Zardosi is an art which creates magic on the fabric. It reflects royalty and was known to adorn the attire of Gods and thus holds a distinguished place among all crafts. The common mango motif of Zardosi has found a place in the wardrobe of Kings and Queens of various eras. The use of gold and silver threads, beads, stones, and imaginative designs has made it one of the most sought after glittering art to decorate fabric. The word "zardosi" is made up of two Persian terms, 'Zar' meaning gold and 'Dozi' meaning embroidery. I have used zardosi on the dancing peacock. Zardosi is outlined using fevicol on the felt cloth. 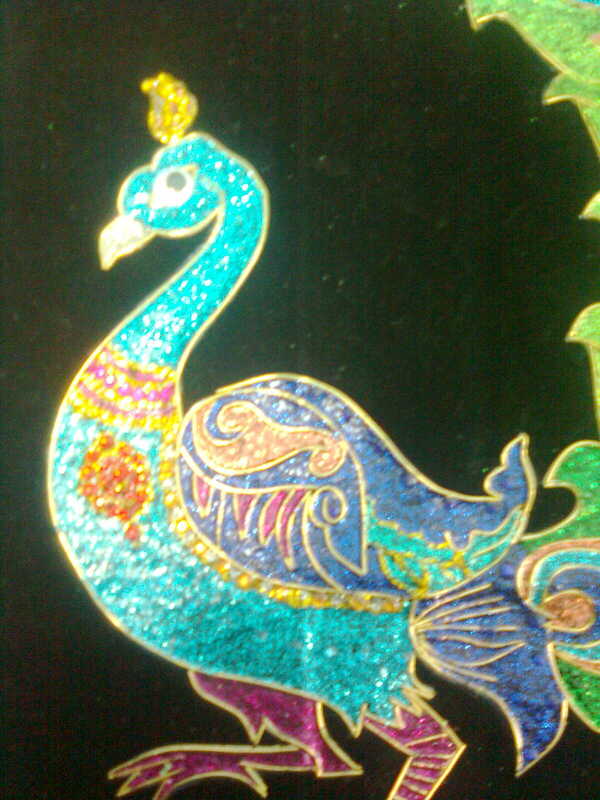 3D glitters are used for filling. 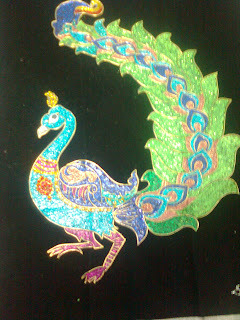 Here is a dancing peacock made out of Zardosi and glitters.